¿Qué hora es? - What time is it? Son las dos. - It's two o'clock. Son las doce. - It's twelve o'clock. Note: The plural form (son) is used for two o'clock through twelve. Instead of saying 15 minutes, cuarto is generally used. Media is used instead of 30 minutes. A la una y media. Note: Minutes up to half an hour are added to the hour using y; above that, they are typically subtracted from the hour with menos. Son las cinco y diez. It's ten till three (2:50). 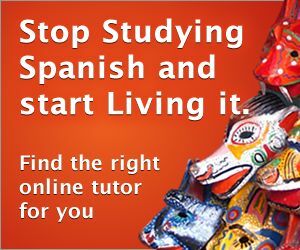 If you still have doubts about how to tell time in Spanish, please review the Grammar section of this lesson. It will provide many more details on Spanish time and several different ways to express times in Spanish. 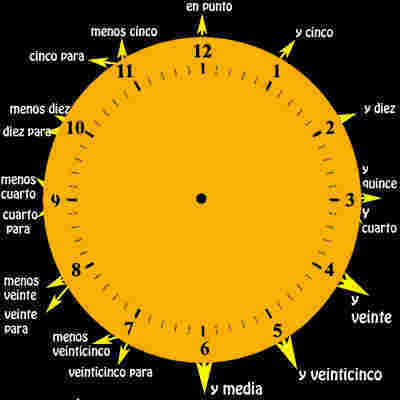 Telling time in Spanish and English do have some similarities. As with English, noon and midnight have special terms in Spanish. Es medianoche. - It's midnight. Es la medianoche. - It's midnight. Ellos toman el bus de la medianoche. They take the midnight bus. Eso es temprano. Yo me levanto al mediodía. That's early. I get up at noon. El tren llega a las tres y media. The train arrives at three-thirty (3:30). Note: The imperfect tense is used to talk about Spanish time in the past. Eran las cinco de la tarde. It was five in the afternoon. Eran las cuatro cuando llegamos. It was four o’clock when we arrived. Eran las once de la noche. It was 11:00 in the evening. The dialogues below will provide you with real-world examples for telling time in Spanish! ¿A qué hora...? - At what time...? A las dos y veinticinco. ¿A qué hora es la película? At what time is the movie? A las cuatro y cincuenta. At what time is the examination? A las ocho menos diez. At what time does the airplane leave? A las diez y cinco.